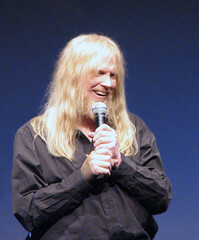 Those of you who know who Larry Norman was probably know that a filmmaker named David Di Sabatino has made a documentary about Larry called “Fallen Angel: The Outlaw Larry Norman, A Bible Story.” (Serious? “A Bible Story?”) At first I was fairly excited about the film, being an old LN fan (I still have original copies of several of his early albums). I saw Larry give one of his final concerts the year before he died. As I started reading things about Fallen Angel, I was bothered by the fact that all of the people who appear in the film were people who were not only critical of Larry, but those who had something to gain by being involved in the film. It just didn’t feel right. Then, I thought about Di Sabatino’s prior documentary about Lonnie Frisbee; while both Frisbee and Norman are key figures in the early Jesus movement, both figures are shrouded in mystery, rumor, and myth. And both films appear to be highly controversial and sensationalist (based on the reviews I’ve read; I’ve not seen either film). In fact, I decided not to watch Fallen Angel after reading a number of reviews and deciding the film looked too much like a hatchet-job. Now, a Norman family friend, Allen Flemming, has put together a website called Failed Angle. While the site is still being built (there are a few “coming soon” pages), there’s a lot there already. Larry’s family has given Flemming access to all of Larry’s correspondence, which supports the facts the way I remember hearing them, not the way Di Sabatino apparently presents them. What is really interesting is that the official Fallen Angel Facebook page (I presume Di Sabatino is behind this page) has a post about the Failed Angle site which states, “How cool is this? The Larry crazies…defending him to the end.” Is there anything about this attitude that is remotely Christ-like? In matters of “he said – she said,” it’s hard to know who’s right; however, when Christians are involved I have found that it’s more beneficial to try to find the fruit of the Spirit. I don’t sense any of it coming from Fallen Angel, which I’m truly sorry to say. Flemming, at least, appears humble and sincere. At least he hasn’t called anybody crazy yet. My point in posting this is just to say that if you were buying into Di Sabatino’s view of Norman, at least check out Flemming’s site and look at all the evidence. This entry was posted on Friday, April 16th, 2010 at 10:18 pmand is filed under . You can follow any responses to this entry through the RSS 2.0 feed. You can leave a response, or trackback from your own site. I was Larry’s guitarist for most of the Back To America tour in 1984. Larry was as screwed up as any of us, but he never, ever denied Christ as the only way to salvation, as David Di Sabatino did tonight on Facebook. David tried to ply me for dirt, he’s a disgusting individual who seems to revel in the frailty of all-too-human Christians. It is sad how we Christians shoot our wounded. I had the opportunity to see Randy Stonehill at a house concert last Valentine’s weekend. He has continued to lift up Jesus and produce some truly great music since his personal life crumbled and rose from the ashes. Yet the body continues to attack him for his past… They will know we are Christians by our love… We have some work to do church! I would like to say that I have almost always liked Larry Norman’s music. I first heard it in the mid 70’s, but wasn’t excited about “Upon This Rock” simple because the production quality just wasn’t there in the early Jesus Music and I was just coming back to Christ and out of secular Rock-N-Role. I was a rocker, the harder the better. But I found a Spirit behind the early Jesus Music (later to become “Contempory Christian Music” or CCM for short) that drew you to it more than today’s CCM. The early artist didn’t demand a certain amount of money they went on donations only. Playing where they could or were invited. It was the only only avenue me and my generation had to listen to other than the traditional Gospel Music that was around at that time. Which started the split or confrontation between the older Christian generation and the younger one. At that time a common saying was “rock music was of the devil”, even the Jesus Music was put in that category. Larry even wrote a couple of songs on the subject and became the outspoken supporter of Christian Rock/Jusus Music at the time. Kinda the “Godfather of CCM”. It seemed that in the early days no matter what Larry or others put out it was demonic. Even his Trilogy (some of his best work) was criticized and thing said about one of the album covers that just wasn’t true. But I and my wife have both enjoyed Larry’s music and the music that others have done for the last 35 almost 40 years now. My wife, I with our 1 year old son had the privilege of seeing Larry in concert when he came to Virginia Beach in the late 70’s and was able to talk with him for quite a while after the concert. He was very down to earth in his mannerism and thoroughly injoyed talking with him. I know he was always seeking to improve the production methods of Chuistian music so it would rival secular rock music. He believed that God’s music should be of the finest quality available. Even the Gospel Music of the time did not have that quality. It was like Christians had to accept second hand stuff all the time. But I have found myself trying to find the old Jesus Music these days, to record it onto CD’s and my I-Pod. Like I said the old Jesus Music had a special anointing of the Spirit behind it and I think it was because it was done from the heart for this new generation of Christians! And without Larry Norman and others like him we would have the Christian music that we have today!!! Well, I do disagree with one thing. Documentaries are almost never objective. They’re always slanted by the filmmaker, the editor and everyone interviewed. The best you can hope for is that they present the interviewees in the light that they want to be presented in. Don’t twist their words. Don’t leave out something significant or something that changes the entire meaning. Don’t put it in a different context. That’s the problem, ain’t it? This is supposedly a documentary. If the title had been “David’s personal view on the live of Larry Norman”, there would have been no questions. And almost none of the people that Jeru is referring to would have cooperated. A documentary is supposed to be objective, while the movie is one sided. I know some people that Jeru knows also, and they aren’t happy with the end result. Only parts of their interviews are used, broken in pieces by the comment the narrator gives, implying things they didn’t say at all. Very clever done, but not true. And then there is the on-line behavior of the filmmaker. That made it clear to me. When he eventually started to attack Pam, because she revealed Davids true intentions, I left the discussion. I personally don’t care where one falls in the “debate.” Believe that the film is accurate; believe that its full of holes; or believe that the truth is somewhere in the middle. Do whatever feels right to you I suppose. Knowing many of the people that appear in the film, I can without the slightest hesitation tell you that they do not all see eye to eye on the subject. They do not all share exactly the same opinion of Larry Norman. Not one that I know ever hated Larry Norman. Not one that I know has a single thing to “gain” by appearing in the film. They are as different as anyone else you know in life. The ones that I know had a very difficult time appearing in the film and many were very worried about how it would turn out and the overall direction. They struggled with the entire idea and have very mixed feelings about it to this day, largely because of their love for the man. Many have very different opinions about how the film turned out and the timing of its release. This is true with any documentary that is made. The participants are all from different places and different worlds. They have nothing to do with the final edits or the final film. Much of their interviews probably end up on the editing room floor. Sound advice. I have only viewed the ‘Norman’ debate from afar, so I can only speak from my own small perspective. Larry’s music had a huge impact on my faith in the late 70’s during those amazing days of the Jesus movement. I am also intensely grateful to him for his interview at an event called the Banquet in the 1980’s – it came at the moment I was coming to question the validity of charismatic teaching. Larry pointed us back to the genuine roots of faith, much to the annoyance of the organizers. I think, whatever his failings (and we all have them), he was certainly a figure who had a faith that spoke to the world, and those early recordings, often with Randy Stonehill on the Solid Rock label are truly legendary.